William Hill are starting to see large five, six and even seven figure wagers on Floyd ‘Money’ Mayweather to beat ‘The Notorious’ Conor McGregor in the mega-fight in Las Vegas on Saturday night. The biggest bet was taken overnight when a punter placed a $1.2 Million bet on the Money man at odds of 1/5 – and stands to pocket $240,000 should the unbeaten king of boxing prevail. However, the big bets only tell one side of the story. ‘The Notorious’ was initially a 7/1 shot to beat ‘Money’ Mayweather (1/16) when William Hill first opened their betting market in December 2016. Since then the weight of money on the Irishman has seen his odds tumble down to 10/3, while Mayweather’s odds have drifted from 1/16 to 2/9 with William Hill. 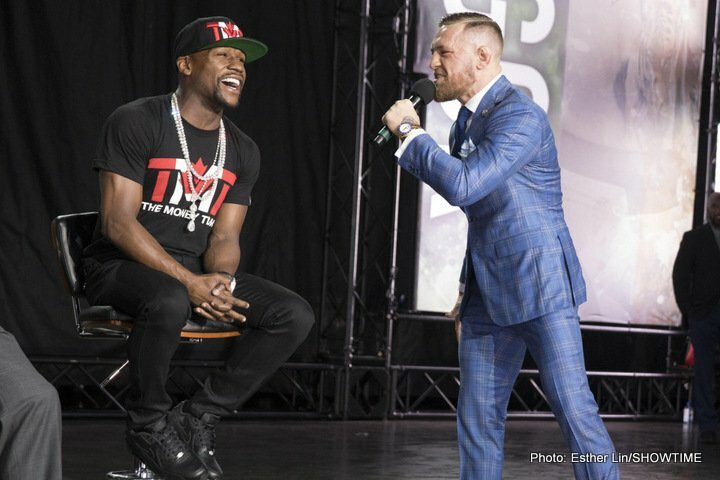 The bookmaker has reported over seventy-six percent of bets have been placed on McGregor, ten percent on Mayweather and fourteen percent on the draw – with the industry estimating a £250M pay out should the Irishman beat the American. McGregor, the self-dubbed ‘Mystic Mac’, has predicted he will win the fight within four rounds – which can be backed at odds of 14/1. William Hill are offering lots of special markets through their #YOURODDS offering. Some of the selected ones are 8/1 Either fighter to win by disqualification, 20/1 McGregor not to land a punch in the fight, 25/1 McGregor to land a head kick on Mayweather, 80/1 McGregor to KO Mayweather inside 60 seconds. As the big fight approaches between Conor McGregor and Floyd Mayweather this weekend, punters have been backing the ‘Notorious’ McGregor in their droves to emerge victorious from the big money bout, despite the arduous task in front of him against one of the greatest boxers of all time. Odds courtesy of Bovada, (www.Bovada.lv, Twitter: @BovadaLV). Who will have more people with them during the fight walkout? Which fighter will have a longer fight walkout? ***Calculated from the first note of the entrance music until the fighter gets one foot on the mat. Will Floyd Mayweather wear a “The Money Team” hat during the fight walkout? Will Lil Wayne wear a shirt during the fight walkout? Will Nate Diaz walk out with Floyd Mayweather? Will Justin Bieber walk out with Floyd Mayweather? Will either corner throw in towel? Will either fighter lose their mouthpiece during the fight? Who will be the first fighter to bleed? Will there be a Boxing Rematch in 2018? Which fight will end first? Will Conor McGregor fight in the UFC in 2017? Will there be a MMA Rematch in 2018? What will there be more of? Previous boxing news: The “Great White Hype” & The Fight For Fifty- Why Floyd Mayweather Deserves To Break Marciano’s record!